Fewer than 3 people per 100,000 are killed in road crashes in Sweden every year, less than almost anywhere else in the world. In contrast, it’s 11 per 100,000 in countries like India and the United States. One reason for the difference? A “Safe System” approach. In 1999, the Swedish Parliament established a road safety program known as “Vision Zero.” Moving beyond the usual driver-focused methods of improving road safety—such as seat-buckling and sober-driving campaigns—the country adopted a Safe System approach. The premise of this approach is that while human error is inevitable, traffic fatalities and serious injuries should not be. Rather than expect humans to behave perfectly, the Safe System makes all parts of the mobility system safe, to reduce the opportunity for a fatal or severe crash to occur. The focus is on reducing people’s exposure to fatal crash forces by keeping speeds to survivable levels and separating transport modes where necessary. The strategy worked—Sweden’s road fatality rate fell 55 percent between 1994 and 2015. Other countries such as the Netherlands and Norway have taken similar approaches. 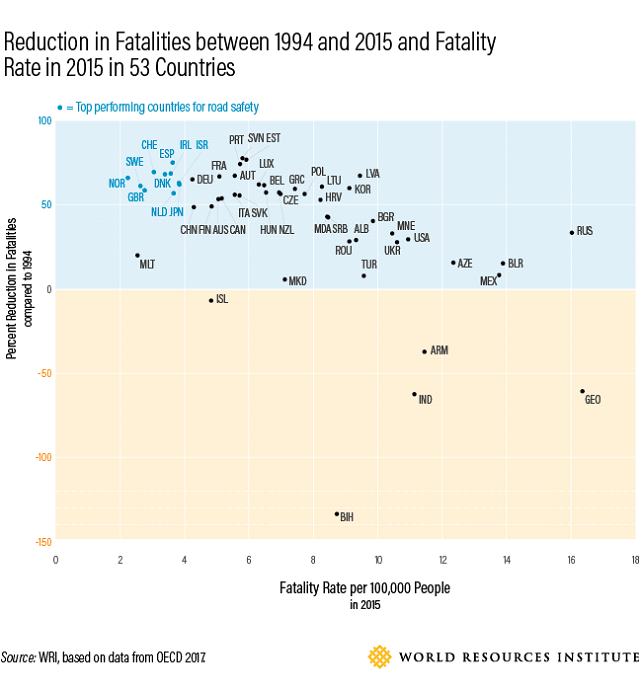 As documented in a new WRI report, countries employing a Safe System have achieved both the lowest rates of traffic deaths and the largest reductions in fatalities over the past 20 years. More than one million deaths could be avoided every year if the rest of the world achieved levels of road safety comparable to these best-performing countries. The approach holds particular promise for low- and middle-income countries, where 90 percent of the world’s traffic-related deaths occur. The way that streets are designed has a powerful impact on how people behave. This may sound obvious, but the reality is that many roads around the world are designed primarily to maximize speeds or improve traffic flow, creating dangerous spaces for road users. Bogota, Colombia recently implemented a Vision Zero Safe System, with the first phase targeting street design around schools and hospitals. “Traffic-calming” measures such as speed humps, reduced lane widths, improved road markings, and protected medians for pedestrians reduced vehicle speeds and increased visibility for people walking. Preliminary results show that this strategy and other Safe System actions have helped Bogota’s road fatalities drop 8 percent in just one year. Research shows that the more private vehicle miles traveled, the greater the exposure to risk for drivers, passengers and other road users. So if more people walk, bike and take public transport, road safety overall improves. As an added bonus, this can also increase physical activity and reduce emissions. In Bogota, officials reformed the city’s chaotic public bus system by implementing a Bus Rapid Transit (BRT) system with dedicated lanes, covered bus stops and high quality buses, while also improving walkways and bike lanes for pedestrians and cyclists. As a result, the city saw a significant drop in traffic fatalities. 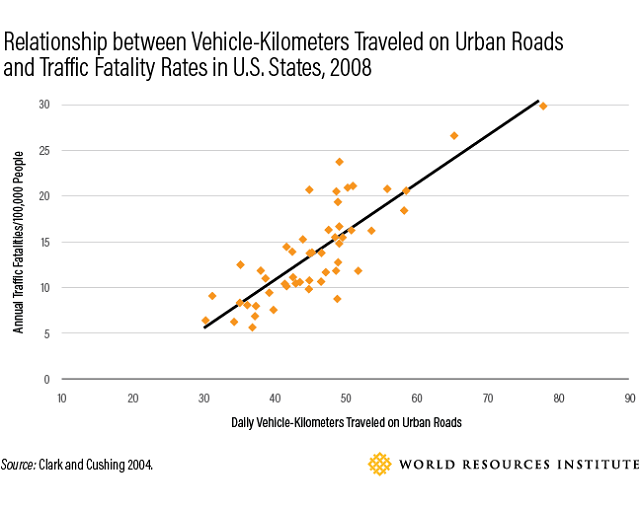 When infrastructure expansion slowed, so did reductions in traffic fatalities. Ambitious plans to further expand the city’s BRT system and install a metro are expected to make the mobility system even safer. At lower speeds, drivers can see more of their surroundings, have more time to react to unexpected events, and can stop in a shorter distance. Furthermore, survivable speeds in collisions are generally much lower than people expect. For example, if hit by a vehicle moving at 30 kilometers per hour (kph) a pedestrian has a 90 percent chance of survival, but if hit at 50 kph, they have only a 15 percent chance of survival. 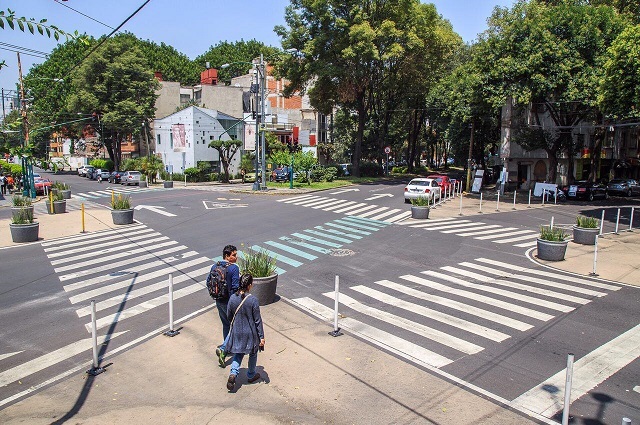 Mexico City, which recently implemented a Safe System-based road safety strategy, reduced its speed limits and updated its fine system for traffic infractions. This and other strategies, such as improved street design, have helped reduce the city’s road fatality rate by 14 percent over the past two years. A Safe System begins with the premise that mobility planners, operators and decision makers must guarantee the safety of citizens and provide road users with the best opportunity to behave safely. That takes strong coordination with a lot of different actors. Sweden’s Vision Zero plan involves traffic engineers, law enforcement, vehicle designers, medical specialists, educators, journalists, social scientists and government officials. A Safe System can be applied anywhere, but it’s especially urgent in the developing world. 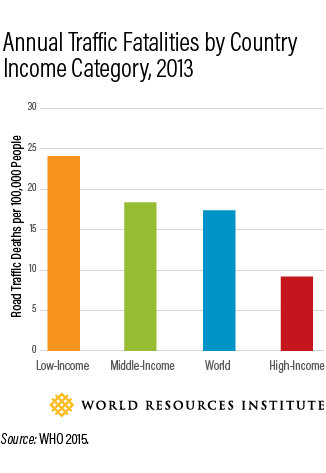 Ninety percent of the 1.25 million annual traffic fatalities occur in low- and middle-income countries. It’s a human health crisis and an economic one: Traffic collisions cost these nations an estimated 5 percent of their economic productivity. That’s like living in a permanent recession—the United States lost 5 percent of its GDP during the 2008 Great Recession. Safe roads are not a luxury, but a necessity, and the cost of inaction is far greater than the cost of action. The stunning thing is that we know how to prevent road deaths. The guidance in Sustainable and Safe: A Vision and Guidance for Zero Road Deaths lays out how. Now it’s up to decision makers, technical experts and communities to start saving lives. Ben Welle is a Senior Associate for Health and Road Safety at WRI Ross Center for Sustainable Cities.